Today we celebrate the love of couples everywhere and this is often extended to other family members. My husband bought me some of my favorite flowers, a beautiful box of chocolates (on the one a day diet), a lovely card and took me out to lunch with my mother and her husband, our daughter and two granddaughters. We invited our three sons to come, but they had other plans and just wanted leftovers. They each have a box of chocolates waiting for them. Lunch was at Olive Garden, one of my top restaurants. We had a delightful time visiting and entertaining the two little girls. Before lunch we were at my daughters home, baking cookies and playing with the girls. They were in a chipper mood. At 6:45am they arose to greet their parents. Our wonderful son-in-law bought them each a bag of valentine surprises, candy and a card just perfect for each girl. Our daughter also had some nice surprises, including a very tender card, and in return she planned a special dinner for him. She made his favorite chocolate chip cookies as a surprise. For the grandchildren this year we sent them Valentine cards in the mail. It is not very often that they receive personal mail and for the two boys in Utah it is much cheaper to send a card than a package and that way they get to spend it as they wish. For the boys a trip out to eat or the nickel arcade is always fun. They share their cards and gifts openings with us on Skype and that adds to our interaction with them. For the girls that live here, earlier in the week we went to the Portland Aquarium, which they love, and then out to lunch. Throughout the week there were homemade Valentines given to us by the grandchildren. These will be long time grandparent's keepsakes. 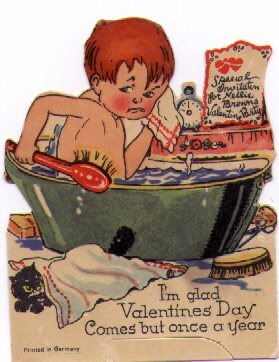 For my ancestors I have some precious Valentines that they sent to each other. In the past this holiday was probably not so commercial, but the opportunity to express our love for each other is still a wonderful reminder of our family connections. Love blooms, blossoms, grows and can flitter away, but for the more part we flourish with the care and concern of those we hold dear to our hearts. Below I will share two mementos of this great love. 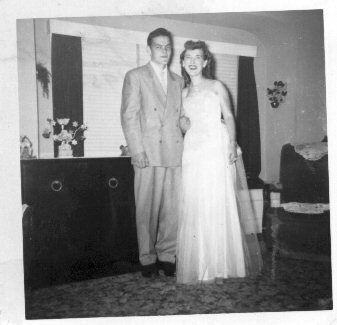 The first is a little card from my father's album and then a picture of my parents during their courtship. As we reflect on the memories of loved ones with us today and those passed, may we realize how precious it is to capture the moments in our family histories for future descendents to appreciate. at her parents home in St. Johns, Oregon.